Manage yourself. Manage your network. Manage your team. -Build and nurture a broad network of ongoing relationships with those they need and those who need them; that is how they influence people over whom they have no formal authority. I like the second point here about networking relationships and also an example where it is important to campaign within a group or company ahead of time before a presentation so no one has the surprise factor. The whole question of how managers grow and advance is one we’ve studied, thought about, and lived with for years. As a professor working with high potentials, MBAs, and executives from around the globe, Linda meets people who want to contribute to their organizations and build fulfilling careers. As an executive, Kent has worked with managers at all levels of both private and public organizations. All our experience brings us to a simple but troubling observation: Most bosses reach a certain level of proficiency and stop there—short of what they could and should be. We’ve discussed this observation with countless colleagues, who almost without exception have seen what we see: Organizations usually have a few great managers, some capable ones, a horde of mediocre ones, some poor ones, and some awful ones. The great majority of people we work with are well-intentioned, smart, accomplished individuals. Many progress and fulfill their ambitions. But too many derail and fail to live up to their potential. Why? Because they stop working on themselves. Managers rarely ask themselves, “How good am I?” and “Do I need to be better?” unless they’re shocked into it. When did you last ask those questions? On the spectrum of great to awful bosses, where do you fall? Anything's possible, originally uploaded by ShashiBellamkonda. I am taking a walk on my second day in Austin and looking up into the sky I see this. It's not a plane ( even though the airport is close by), it's not a bird ( it's too high) and it's not superman because there is no movie theater near by. 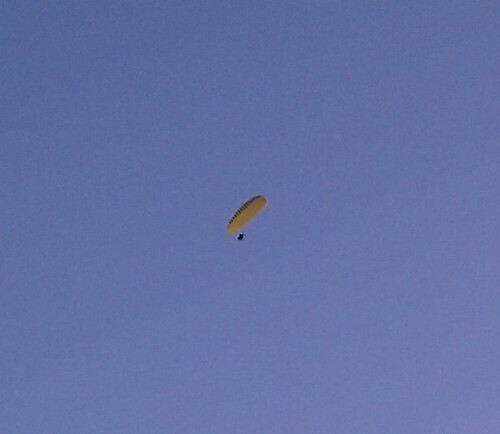 It was nice to see a glider( could hear the motor) but wonder where they would land .. Is it usual to see this in Austin. are folks using gliuders to commute - seems like a awesome idea. The Economist ( Yes ! I like the economist very much) has an interesting article on how over the past 400 years the West has maintained a promise of better times from generation to generation. Now hope is on the move.
" The rise of positive thinking ", population demographics and Nandan Nilakani's quote" greatest achievement lies not in producing technology but redefining the boundaries of the possible" make this an interesting article to read. There is also a takeaway that along with propserity comes responsibility - a message for the BRICI countries. Now hope is on the move. According to the Pew Research Centre, some 87% of Chinese, 50% of Brazilians and 45% of Indians think their country is going in the right direction, whereas 31% of Britons, 30% of Americans and 26% of the French do. Companies, meanwhile, are investing in “emerging markets” and sidelining the developed world. “Go east, young man” looks set to become the rallying cry of the 21st century. For most of its history America has kept its promise to give its citizens a good chance of living better than their parents. But these days, less than half of Americans think their children’s living standards will be better than theirs. Experience has made them gloomy: the income of the median worker has been more or less stagnant since the mid-1970s, and, thanks to a combination of failing schools and disappearing mid-level jobs, social mobility in America is now among the lowest in the rich world. When may of the folks I know visit the US they want to go to Niagara Falls, Disneyworld and New York. As the economy changes travel patterns will change and more Asian countries will encourage their citizens to visit other countries. This Economist article talks about the places that Chinese are flocking to see in Europe and not necessarily the ones that the locals think are popular. Mount Titlis in Lucerne Switzerland, Kings College Cambridge. Strangely UK does not get many of these tourists since UK is not part of the border-free Schengen zone and it's a nightmare for Chinese tourists to get visas to any European country. Enjoy reading the Economist article. When the bamboo curtain lifted a generation ago, the first contact many Chinese had with the outside world was in the form of imported goods, whose foreign fame was viewed as intrinsic proof of quality. Even today, seen from a Chinese tour bus, the continent of Europe resembles not so much an ancient collection of cities and nations as a glittering emporium stocked with brands. Those brands are not always commercial products: the grand tour takes in the birthplaces of world-famous people, the seats of globally renowned institutions and—as in Cambridge—sites linked to well-known literary works. A stop in Metzingen involves a tribute to another German, the suitmaker Hugo Boss. A short drive from Frankfurt, Metzingen is home to several factory outlets, where Chinese shoppers vie with Russians and Indians as the biggest spenders. It is a standing joke among Chinese travellers that many products snapped up abroad bear “Made in China” labels. But there is some sense to this seeming madness. Thanks to hefty taxes and customs duties, European brands are routinely 40% more expensive back home. In China they are also quite likely to be fakes. Great gift for parents with teenagers, originally uploaded by ShashiBellamkonda. I bought this on Amazon amzn.to/g5qpDE A few years ago the MD Transportation dept used to give out these magnetic signs but with the serious 'Rooki e Driver" This sign is hilarious. 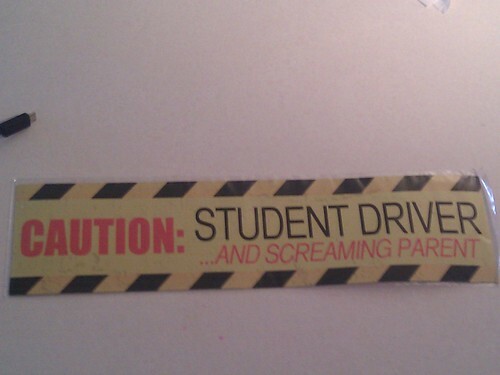 good gift for parents with teenagers. I have had great experiences with the post office. I have changed my address a couple of times and every time the post office ( 20878) had forwarded the mail beyond the 6 months date. The mail always arrives on time snow or rain (20854) and always courteous. It is easy to place a vacation hold and temporarily forward mail if you are going on a long vacation. And best of all I was thrilled to read this Popular mechanic's article : Which Shipping Company Is Kindest to Your Packages? Guess who has the gentlest touch ? Thank you USPS , thank you post person of zip code 20854. Happy Holidays ! At this time of the year we look forward to this parade by the Rockville Volunteer Fire Department who will carry on its tradition of parading from downtown Rockville to Gaithersburg as it carries a lighted menorah on a fire truck Thursday night.. The Menorah Fire Truck parade will leave Rockville Volunteer Fire Station 3 at 380 Hungerford Drive in Rockville at 6 p.m.
- First stop: Fallsgrove, corner of Fallsgrove Boulevard and Shady Grove Drive, estimated arrival time is 6:15 p.m.
- Second stop: Potomac Glen, Shady Grove Road and Cavanaugh Drive, estimated arrival time is 6:45 p.m.
- Third stop: Chanukah Wonderland, Travilah Square Shopping Center at 10066 Darnestown Road in North Potomac, estimated arrival time is 7 p.m.
- Fourth stop: Washingtonian Woods in Gaithersburg, pool on Midsummer Drive, estimated arrival time is 7:15 p.m.
- Fifth stop: Lakelands Park in Gaithersburg, estimated arrival time is 7:25 p.m.
- Final stop: Chabad of Upper Montgomery County, 11520 Darnestown Road in Gaithersburg, Grand Hanukkah Party and lighting of the outdoor menorah at 7:30 pm.